Portland International Airport (PDX), much like the city itself, takes pride in all things local and unique. The array of food, drinks and art throughout its five concourses communicates that pride in no uncertain terms. Kama Simonds, spokesperson for the Port of Portland, notes that PDX follows an unconventional approach to concessions, and local companies provide fully 70% of its lineup. Two of its latest additions—House Spirits Distillery and Hollywood Theatre—offer passengers more than local products. They provide experiences. In lieu of the prime concessionaire model, PDX operates a series of unique brands with individual leases, explains Simonds. Each tenant is tasked with managing and championing its own brand and products. Shane Andreasen, senior manager of concessions development, reports that PDX has found success with this model. Customer surveys conducted several times a year indicate that roughly 80% of PDX passengers prefer local businesses to national chains. Not surprisingly, local concepts at PDX continually outperform their national counterparts, notes Andreasen. He acknowledges that the policy can be a double-edge sword for concession vendors. The costs of operating in an airport are higher than elsewhere, but 19 million potential customers stream through the facility every year. “Businesses don’t have to rely on cycles of a downtown market,” Andreasen remarks. 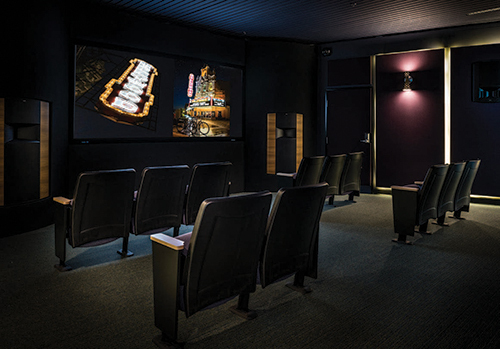 Following its themes stressing local and unique, PDX provides a “microcinema” where passengers can watch an hour’s worth of short films (each 10 minutes or less) made by local Oregon filmmakers. The nonprofit venture is the brainchild of Doug Whyte, executive director of Hollywood Theatre; and PDX is the organization’s second location. The 19-patron, 815-square-foot theater is located in Concourse C, where passengers can take in a variety of free short films while waiting for their flights. The idea came to Whyte from an article in the New York Times about Theaters in a Hong Kong airport. He was already running a theater in northeast Portland, and loved the idea of opening another at the airport. Whyte reasoned that short films seemed like a natural fit, because most PDX passengers do not have long international layovers. The airport’s public arts team agreed, and the project progressed. The Port of Portland closed an underutilized business center to make room for the nonprofit initiative and teamed with Hollywood Theatre to secure funding for the roughly $500,000 project through grants from the Oregon Community Foundation, Oregon Arts Commission, Oregon Cultural Trust and Travel Oregon. Triad, a speaker company based in Portland, donated an elaborate sound system, and Barco donated the film projector. The theatre project also received several small private donations and many hours of pro bono work. From start to finish the project took three years—including negotiations with the Port of Portland, fundraising and design/construction. “It was complicated and expensive, but totally worth it,” Whyte reflects. The large, glimmering neon marquee, by Security Signs of Oregon, is one of the theater’s most impressive elements, he reports. Because the sign was deemed an art installation, Hollywood Theatre received approval to exceed regular size restrictions for airport signs, and the 4-foot-tall marquee stretches for 30 feet. Airport personnel and Whyte report that the theater has been well received by passengers since its February 2017 debut. It is always busy, and feedback on social media has been universally positive, notes Whyte. With 19 million annual visitors, the airport provides an immense platform for local filmmakers. Whyte notes that the theater’s relationship with the airport is very positive, and he describes PDX as inventive, supportive and enthusiastic about local business and the arts. “It’s a great partnership story, and a great amenity for travelers,” agrees Simonds. Drafting off the current popularity of craft spirits, PDX recently opened House Spirits Distillery Tasting Room, where passengers can taste and learn about the company’s award-winning offerings. Décor in the 950-square-foot facility is sleek and modern—just like the aesthetic of the company’s flagship location in southeast Portland, which also houses a production facility. 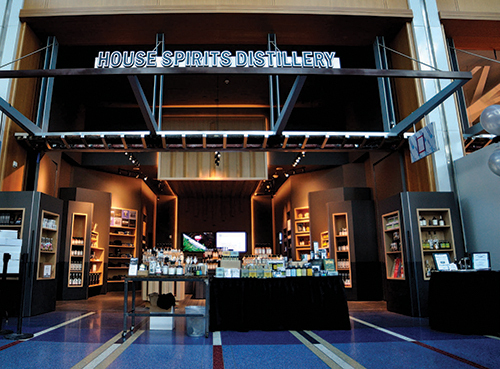 The new airport concession—part retail, part tasting room—provides passengers with the full House Spirits product line and an assortment of merchandise. The Westward Whiskey Flight is reportedly the most popular selection at the tasting counter. Despite the time constraints inherent to any airport environment, the vibe is fun and relaxed, says Kelly Woodcock, partner and director of retail and hospitality for House Spirits. The company is not new to PDX. In fall 2013, it installed a kiosk that proved so popular, company officials decided to invest in more space. House Spirits hired R&H Construction, a local firm with several years experience at PDX; Osmose Design, the team responsible for House Spirits’ original facility; and Acme Design for the bar and cabinetry. Construction began in July 2016, and the new concession opened for business a few months later, in November. Woodcock notes that building at the airport was complex, but praises the concessions team for its assistance. “PDX does a really good job of partnering with you throughout development, design and construction,” she says. As is often the case, Woodcock cites planning and communication as key elements to the success of the project.